As a medical professional, you already know how important fast medical care is for successful outcomes in nearly any health crisis. With fast care, mobility can be restored, infections averted and quality of life saved or improved. However, one of the most important areas for fast medical assistance is with cardiac arrest. When you’re the one to notice this life-threatening emergency, you must be confident enough to jump into action immediately and get help from other professionals as quickly as possible. As a medical professional, you may immediately think that you know what cardiac arrest is. However, it can be easily confused with other health crises involving the heart. For example, you might think that a severe heart attack is the same thing as cardiac arrest. While a major heart attack can certainly put your patient into cardiac arrest, these are not the same health emergencies. Cardiac arrest is defined as complete lack of heart function. This often happens when your patient goes into ventricular fibrillation, which is the most frequently seen cause of arrest. However, ventricular tachycardia or pulseless electrical activity can sometimes lead to cardiac arrest. In any of these scenarios, your patient may or may not have any rhythm on his EKG, and he will have no pulse when he falls unconscious. The reports on life after sudden cardiac arrest can seem grim. Out-of-hospital events typically see only a 10 percent survival rate while in-hospital arrests see a 24 percent survival rate. Obviously, the faster response in the hospital leads to better outcomes. Overall, V-fib and pulseless V-tach see better success rates overall with an up to 64 percent survival rate in-hospital. A quick response is most probable when you’re carefully monitoring your patient especially with the use of an EKG monitor or remote monitoring. The best results have also been seen with quick CPR and defibrillation. While other portions of the ACLS cardiac arrest algorithm are important, these two responses are most vital. How Should You Respond in a Medical Setting? As a trained medical professional, your best response will be seen when you are at the hospital or clinic where you can quickly get your hands on the crash cart and have unlimited access to necessary medications and other personnel. You should immediately call a code, both with the nearest code button as well as audibly to your nearby coworkers. While waiting for the crash cart, you should start CPR with compressions between 100 to 120 per minute, which is probably faster than you would assume. The next person in the room should give oxygen and attach the patient to a defibrillator. Once you have gotten this far, you are well on your way down the sudden cardiac arrest algorithm for ACLS. If you have a shockable rhythm, this is the next most important step following CPR. Your next responders will follow the algorithm pathway to determine if drugs, such as epinephrine or amiodarone, need to be given. A respiratory therapist should also be on hand to place an advanced airway. How Should You Respond Outside the Hospital or Clinic? While sudden cardiac arrest outside the medical setting is certain not ideal, you have a unique opportunity to be the cause for lasting good for this individual. 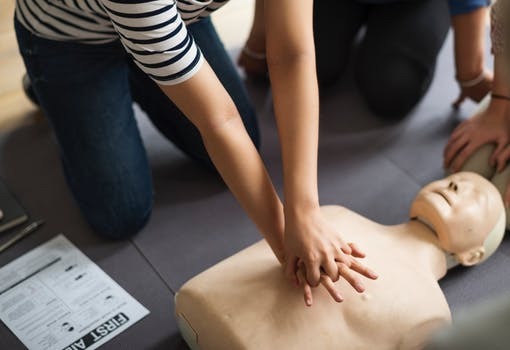 CPR is always possible wherever you are, and as a trained professional, you will be giving the individual excellent care. After calling for help and for emergency medical responders, you can also ask someone nearby to find an AED if possible. Many public settings, such as malls and churches, have these available today. As always, the best outcomes occur when you’re confident in what you need to do for the patient and when you’re able to work as a team. Advanced Cardiac Life Support training is vital for both of these needs. With plenty of review and team interaction, you will practice many scenarios, including the sudden cardiac arrest algorithm. Your ability to respond swiftly to this medical crisis whether you’re in the hospital or at your local shopping mall can mean the difference between life and death for your patient.